Financing at RT. 82 Auto Gallery | Bad credit financing available on used cars and trucks in Columbia Station, Ohio! Get Financed at RT. 82 Auto Gallery! At RT. 82 Auto Gallery Inc, we are experts at offering affordable credit terms and low interest rates from numerous lending institutions. As an owner with an extensive finance background, I will match each customer with the rates and terms for the vehicle personally selected by the customer. Financing a vehicle at Rt. 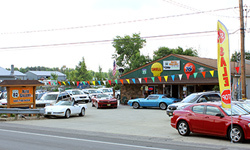 82 Auto Gallery is an easy, no-hassle process that ensures you leave with a payment that you are comfortable with. Get started today by filling out the finance application below or giving us a call at (440) 748-4004. I understand that by clicking on the checkbox below I am providing written instructions to Rt. 82 Auto Gallery under the Fair Credit Reporting Act authorizing Rt. 82 Auto Gallery to obtain information from my personal credit profile or other information from TransUnion, Experian or Equifax. I authorize an Rt. 82 Auto Gallery to obtain such information solely to prequalify me for financing options.